Phew! October came and went, didn't it!? Sorry for my little hiatus, I hate leaving ya'll hanging when I know you want more quality free accessory designs! I had A LOT going on last month. My daughter had so many football games to cheer, I needed to sew my girls some Halloween costumes, and I had a very large crochet order come through that I'm almost (mercifully) done with. I admit I kinda got burnt out and I took a small vacation from crocheting as well. It didn't last long though! A few days later I was jonesing to pick up my hooks again. When this happens, I always make sure to treat myself by making something I WANT - FOR ME! This is a good lesson to learn in life in general, especially for mothers/fathers/primary care givers (you know who you are and how hard you work). You can't take care of everything and everyone unless you're taking care of yourself too! Remember that! I'm a big fan of Bethany Dearden (and not just because we have the same name!) and her blog Whistle and Ivy. She recently unveiled an adorable CAL (i.e. Crochet-A-Long) of a Nativity of the Holy Family just in time for Christmas decorating. So, I made my stalker-like love of her official and signed up for her newsletter to make sure I would not miss a piece. Needless to say, it's SUPER cute. You should really make yourself a set. Your kids will love playing with the little figures! 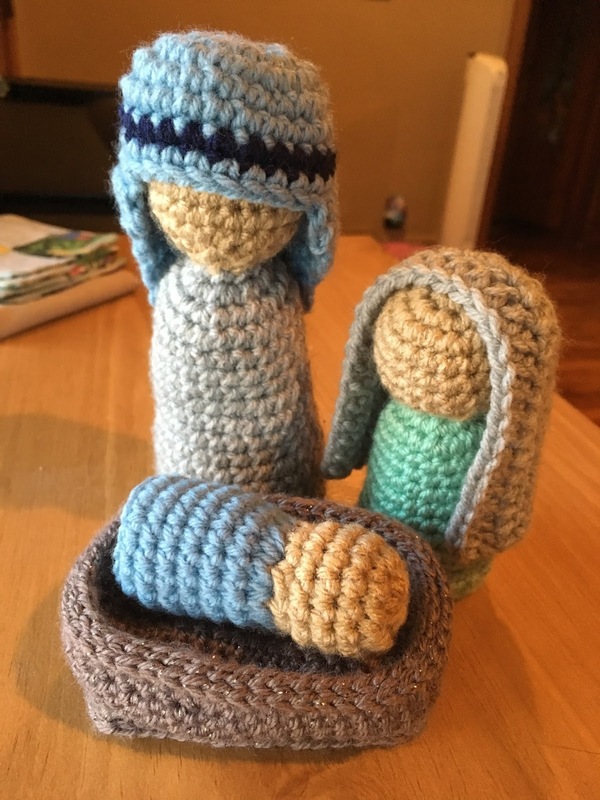 I made this precious crochet Nativity from Whistle and Ivy. 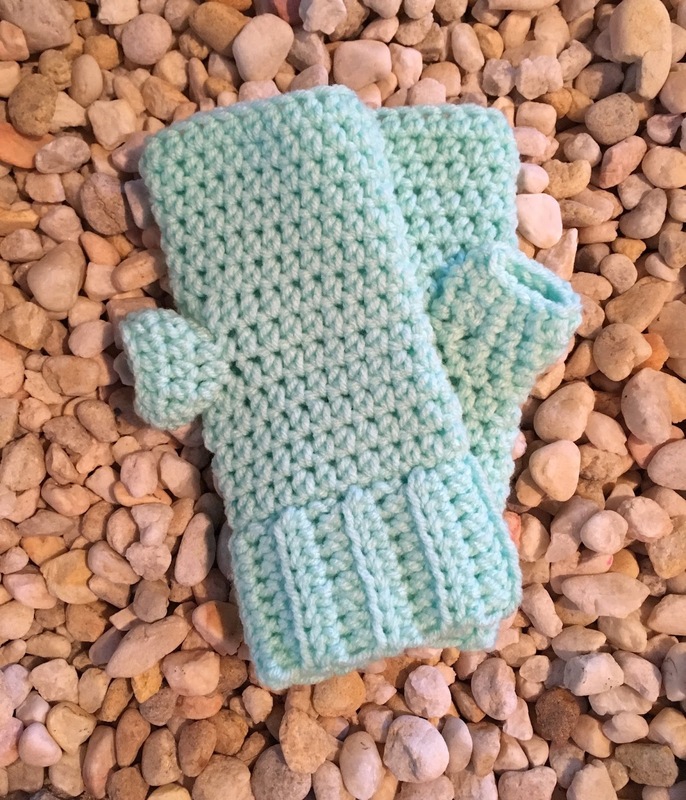 Now I'm finishing up my big custom order and I decided I needed to share with you these quick and simple mittens. 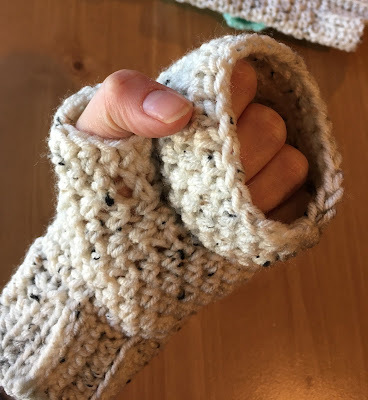 I call them "Quick Mitts". Tres original, no? Lets face it, everyone has a smart phone. 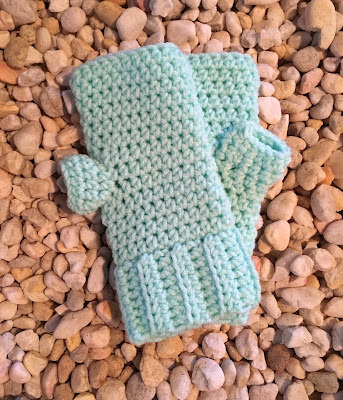 Gone are the days when a super soft comfy warm pair of mittens will do the trick. You'll wear them once and then realize you have to take them completely off to use your phone. This is less than desirable. So here's my solution. Get the look you love, comfort you crave and the warmth you want out of a crocheted pair of mittens with all the fun, flair and phone access you need! You can make these as a gift in any color, and they will stretch to fit most hands comfortably. The best feature is, you can make them as long or as short as you want. Go almost full finger coverage, or barely there for warmer days! You decide! I made the fingers and thumbs very tall for maximum warmth and I can tuck my finger tips down in the gloves when I need to, or keep them out to use my phone at any time, without the hassle of a flip over finger panel. I've tried them, they're a pain! And they stretch out. Not a fan. 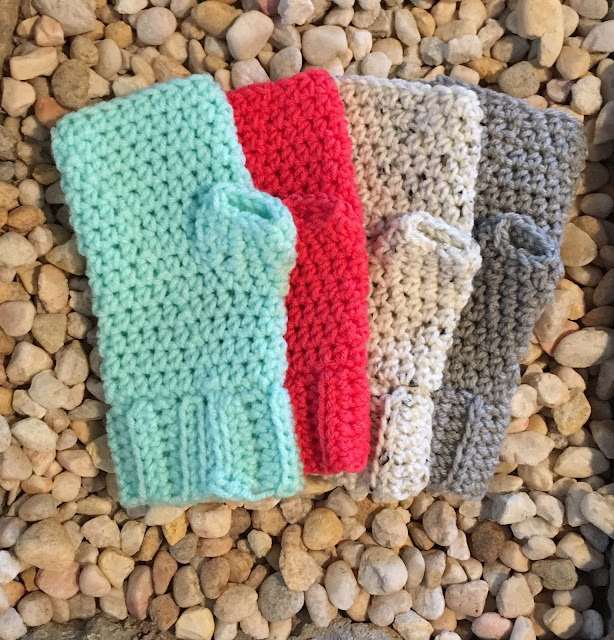 I guarantee you'll be a fan of these gloves, though! 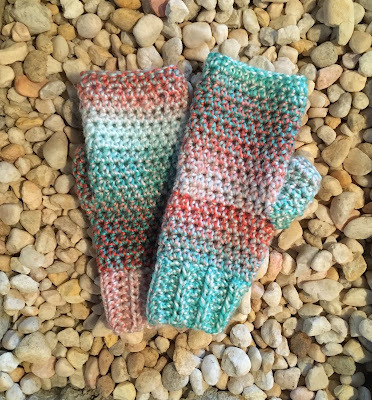 Once you get the hang of this simple pattern, you'll want to make multiple pairs for everyone you love! 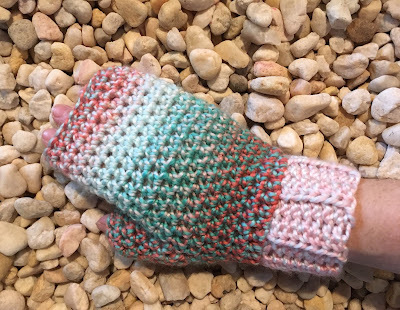 Enjoy this Quick Mitts FREE glove pattern. Please share your results on my Facebook page, and be sure to look me up on Ravelry. I'm here to help so any comments, questions or feedback are always welcome! A printer-friendly, ad-free PDF version of this pattern is available in my etsy shop or you can click this button to get it from my Ravelry store! Thank you for your support and for helping me create more free patterns! It's almost Christmastime so get to craftin' people! Notes: Left and Right Hand gloves are made identically, except for thumb hole round. See instructions for more details. Joined rounds are worked as follows: make first hdc in next st (after join), at round end, make final hdc in join st. Length of finger and thumb coverage is totally customizable- simply add or delete rounds for a custom look! Row 3-15: repeat row 2. Fold cuff in half, matching up stitches, sl st evenly through stitches on both edges to form a tube. Do not break yarn. Turn tube 90 degrees so raw edge faces up, ch 1. Round 1: Working loosely along raw edge of cuff tube, sl st evenly around making 23 sts in total. 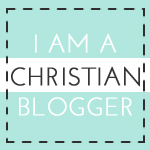 Do not join, ch 1. *Throughout pattern, at join ch 1 and st in next st, at round end, make last st of rnd in join st. Round 3-5: Hdc in the next stitch, and in each st around, join, ch 1. Round 6: FOR RIGHT HAND GLOVE- Hdc in first 2 sts, ch 4, sk next 4 sts, hdc in remaining 17 sts, join, ch 1. Round 6: FOR LEFT HAND GLOVE- Hdc 17, ch 4, sk next 4 sts, hdc in last 2 sts, join, ch 1. Rounds 7-13: hdc in the next st, and in each st around, join, ch 1. 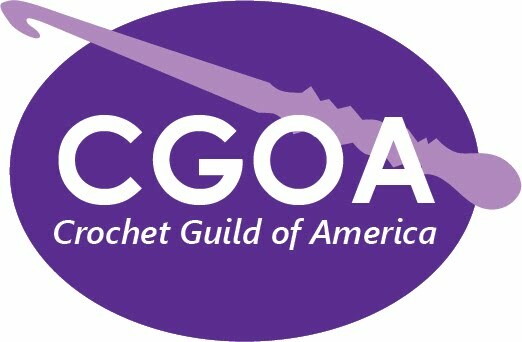 For more finger coverage, crochet an additional 1-3 rows as desired. Work up thumb hole an additional 1-3 rounds as desired for more or less thumb coverage.